Do seasonal books sell and circulate all year round? Which Caldecott title contains the fewest illustrations? Which "Little House" artist is your favorite? Does a female powerlifting champion with a crew cut know she's being used to sell a new YA novel? These are some of the questions we ask in today's Sunday Brunch blog. I didn't get a chance to see the animated feature film UP when it was released in 2009, so I made a point of recording it off TV last night. I really enjoyed it -- especially the moving first half hour. I wasn't as fond of the talking dogs but, hey, what's a kids' movie without animals that talk? Every time a movie gets made from a children's book -- or any book, really -- the usual response is, "The movie wasn't as good as the book." Can you imagine one nice, short, entertaining movie spawning this many books? I can imagine many contemporary kids growing up and remembering UP as one of their favorite childhood movies. I can't imagine ANY kids growing up and remembering any of these books as childhood favorites. Decades from now, people may still be enjoying the movie, but the only place you'll be able to find most of these movies is in landfills everywhere. With Thanksgiving just three days away, I recently took a look at the only Thanksgiving book ever recognized by the Caldecott committee. 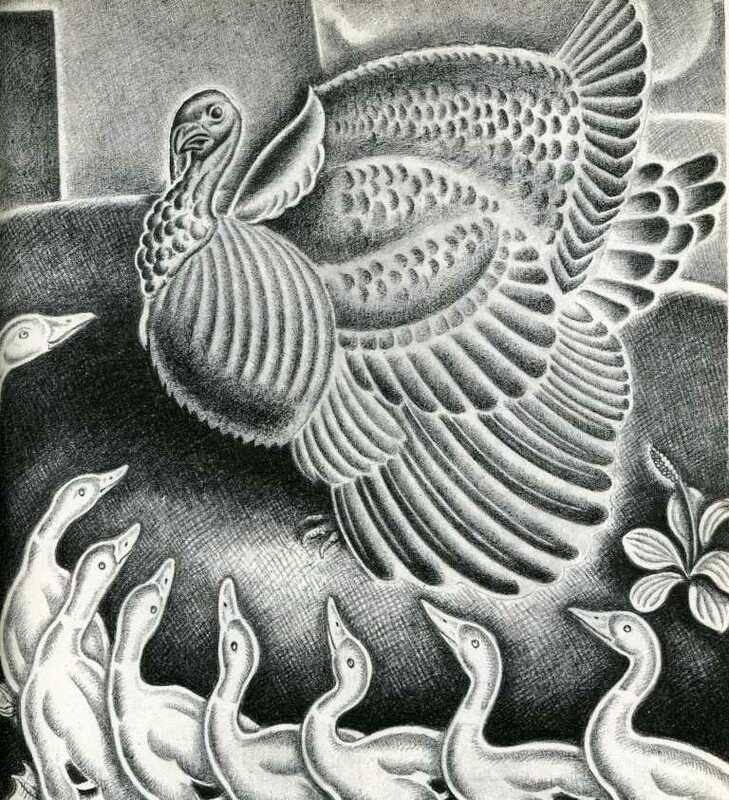 It's the 1955 Honor Book, THE THANKSGIVING STORY, written by Alice Dalgliesh and illustrated by Helen Sewell. This got me thinking about the various holiday books that have been recognized by the Caldecott committee over the years. The Dalgliesh is the only Thanksgiving book, isn't it? There's one Hanukkah book -- the 1990 Honor HERSHEL AND THE HANUKKAH GOBLINS, written by Eric Kimmel an illustrated by Trina Schart Hyman. There's one Easter book -- the 1950 winner THE EGG TREE by Katherine Milhous. This led me to wonder about the readership of seasonal books during the course of the year. I've been in many children's libraries in my lifetime and have noticed the varied way they handle seasonal and holiday books. Some leave all holiday books on the shelves all year round. Others keep them in a special section, but only emphasize the current holiday. Still others store them "behind the scenes," only bringing out the Christmas books, for instance, after Thanksgiving. My question to you is this: If you work in a library or bookstore, do you notice that holiday books only circulate/sell during a very small window of time surrounding that particular day? If you publish holiday-themed books, do these titles generally earn less money than generic books not associated with holidays...or do Christmas books sell so well during the holiday season that they essentially make as much money in six weeks as other books make in fifty-two weeks? I also wonder if "seasonal" books are somewhat limited in sales and circulation. For example, there are three Caldecott winners about snow (WHITE SNOW, BRIGHT SNOW, 1948; THE BIG SNOW, 1949; THE SNOWY DAY, 1963.) Are these books bought or borrowed as much in July and August as they are in December and January? Granted, one of the joys of reading is being transported to another place and time...yet I can't imagine myself picking out a "snow" book in summer. On the other hand, spring and summer seem to be the "default" setting for most picture books so somehow it wouldn't seem strange to read such a book in the dead of winter. So what do you think? Are such books limited to their season or not? One of the things that most surprised me about this book was how few illustrations it includes. There is the cover illustration, as well as a double title-page tableau. Beyond that, there five single-page illustrations, two half-page illustrations, and a final double-page spread featuring Thanksgiving dinner. A few pages have brown silhouettes around the edge of the page (birds, animals, grapes) and there are two additional illustrations -- one showing the interior of the Mayflower and map -- done by a completely different artist, Rafael Palacios. So here is my question for Caldecott trivia masters. Seeing how few illustrations there are in this book has made me curious: what Caldecott winner or Honor Book has the fewest number of illustrations of all? I have no idea what the answer is, but I'm curious if anyone else knows. Are there are Caldecott books with fewer illustrations than THE THANKSGIVING STORY? Although THE THANKSGIVING STORY was the only time Helen Sewell was honored by the Caldecott committee, she had a long and distinguished career in book illustration. 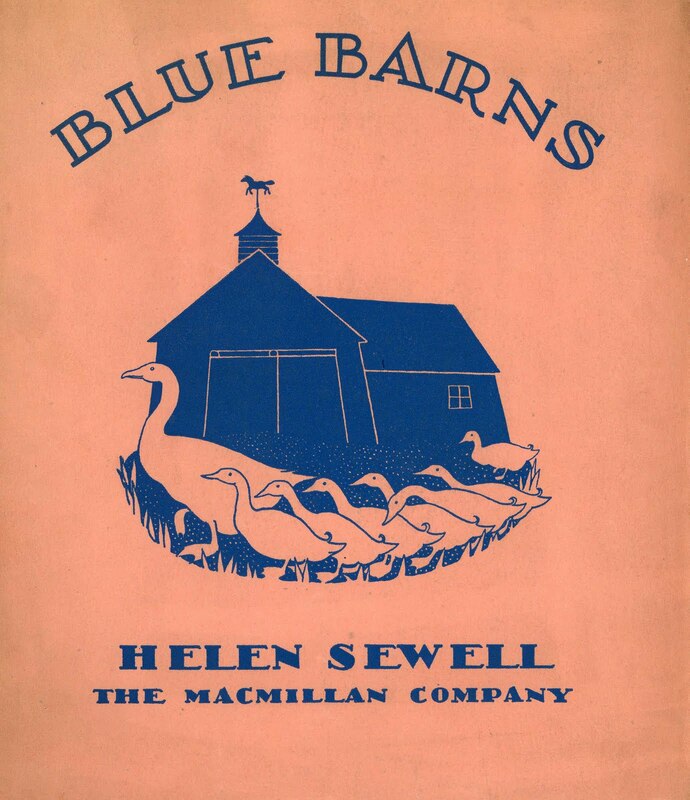 She entered the field in 1928 with MENAGERIE : POEMS FOR CHILDREN by May Britton Miller, but also provided illustrations for new editions of classic works (PRIDE AND PREJUDICE; Emily Dickinson's POEMS) and wrote a few children's books of her own, most notably BLUE BARNS. 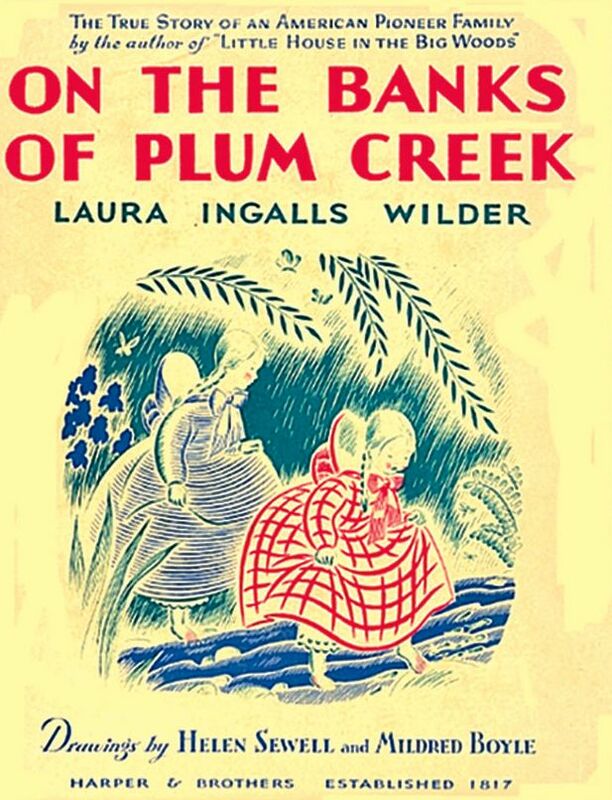 But to many readers, Ms. Sewell is best-known for providing the illustrations to Laura Ingalls Wilder's "Little House" series. After illustrating LITTLE HOUSE IN THE BIG WOODS, FARMER BOY, and LITTLE HOUSE ON THE PRAIRE on her own, she collaborated with Mildred Boyle for the remaining books in the series. The reasons for this remain a bit murky. According to a letter from Laura Ingalls Wilder's publisher, Ms. Sewell was in a bad car acccient and required help with her work. She would continue doing the jackets and frontispieces,but suggested that Mildred Boyle collaborate on the rest of the illustrations. Some question the car accident story and just think that Sewell was overworked, with contracts to illustrate a number of books. Whatever the case, Mildred Boyle, whose only previous children's book was NANCY ALDEN by Eliza Orne White (1936), joined Sewell in illustrating the remaining five volumes in the series. 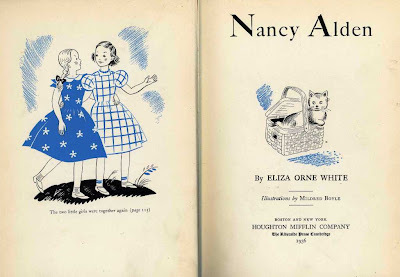 Though she illustrated three or four other children's books in the forties and fifties, there is not much information out there regarding Mildred Boyle. But for a couple generations, readers of the "Little House" books knew only the work of Sewell and Boyle. This all changed in 1953 when Harper editor Ursula Nordstrom decided to reissue the series in a new uniform edition. 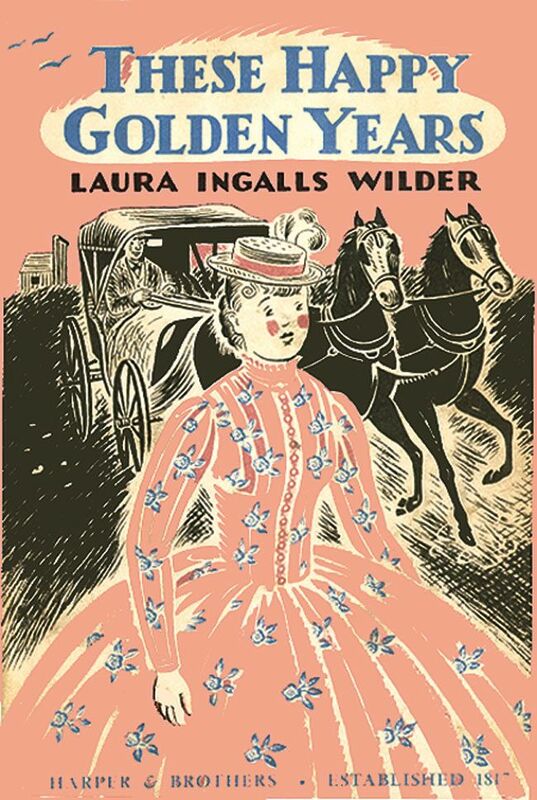 Before then, the books were published in different sizes and with different fonts (the original LITTLE HOUSE IN THE BIG WOODS was square and blocky with large print, while the last volume, THESE HAPPY GOLDEN YEARS resembled a young adult book in size and typeface.) Nordstorm commissioned Garth Williams to illustrate the entire eight-volume series and, to readers from the second half of the twentieth century on, it's hard to imagine the books ever looking any different. This was the only "Little House" book that Sewell did not illustrate, as it was not published till 1971. As mentioned, THE THANKSGIVING STORY was the only time the Caldecott committee called on Helen Sewell. 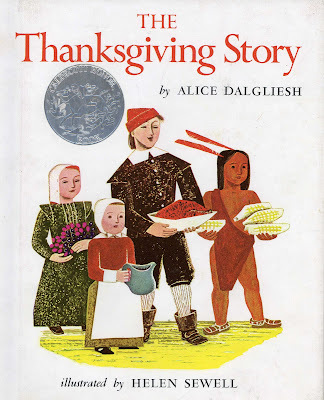 It was also the only time one of Alice Dalgliesh's books wore a Caldecott seal. She was much more used to being a Newbery Honor author. 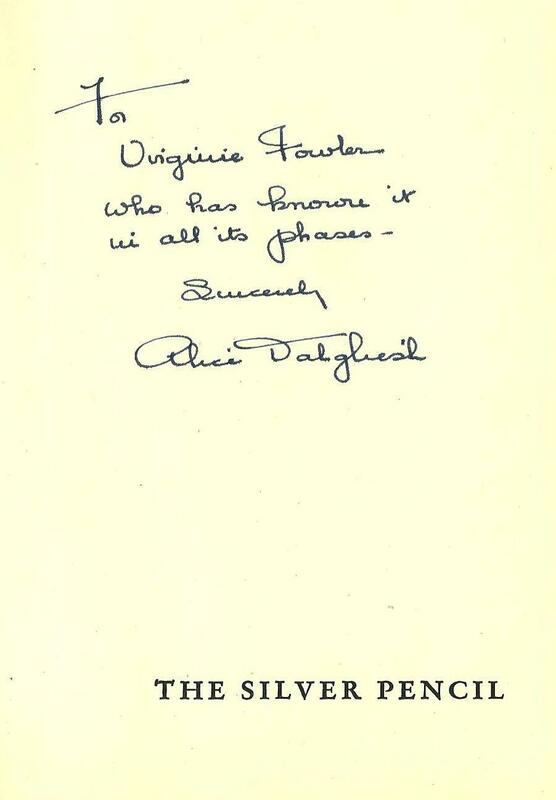 Children's book editor at Scribner's from 1934 to 1960, Alice Dalgliesh was also a prolific writer. Three of her titles -- THE SILVER PENCIL, THE BEARS ON HEMLOCK MOUNTAIN and THE COURAGE OF SARAH NOBLE - were named Newbery Honors. The latter two remain in print in both hardcover and paperback today -- a rather extraordinary feat considering they were first published in 1952 an 1954 respectively. Published in 1944, THE SILVER PENCIL is much lesser known, but should be of interest to anyone interested in children's books and writers. It's a highly autobiographical novel in which aspiring writer Janet Laidlaw (read "Alice Dalgliesh") moves from her birthplace in Trinidad to her family's home country of England, and finally settles in the United States, where she teaches kindergarten and achieves her dream of publishing a book. It's a fascinating glimpse into Dalgliesh's own life and career. A few years later, Ms. Dalgliesh published a sequel, BEYOND JANET'S ROAD, which traces the protagonist's later career as a children's book editor. This book never caught on with young readers for several reasons. For one thing, it didn't have the globe-trotting locations of the original novel, plus Janet is already well in her twenties when this book begins. And while many aspiring young writers might be drawn to THE SILVER PENCIL to see Janet struggle with becoming a writer, how many kids dream about becoming children's book editors? Darn few, I imagine. 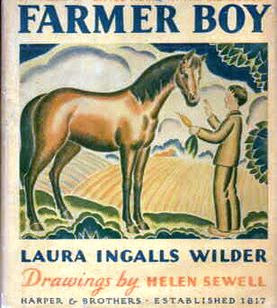 Still, those of us with an interest in the history of children's books often love this novel for its insights into the publishing world. Plus it's fun to speculate on who the characters represent "in real life." I'm pretty sure that one is Rachel Field, while another is likely Ernest Heminigway. 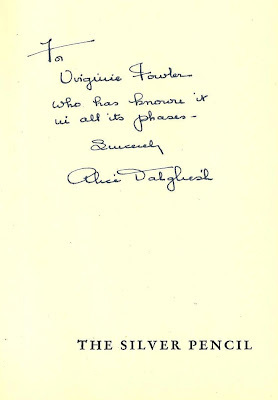 At the time I bought this, there was also a copy of ALONG JANET'S ROAD available, inscribed by both Dalgliesh and the book's illustrator, Katherine Milhous, to the same editor. I could not afford both books. So somewhere out there there's another reader/collector/fan who has a copy of ALONG JANET'S ROAD inscribed to the editor and wishes they also owned THE SILVER PENCIL. 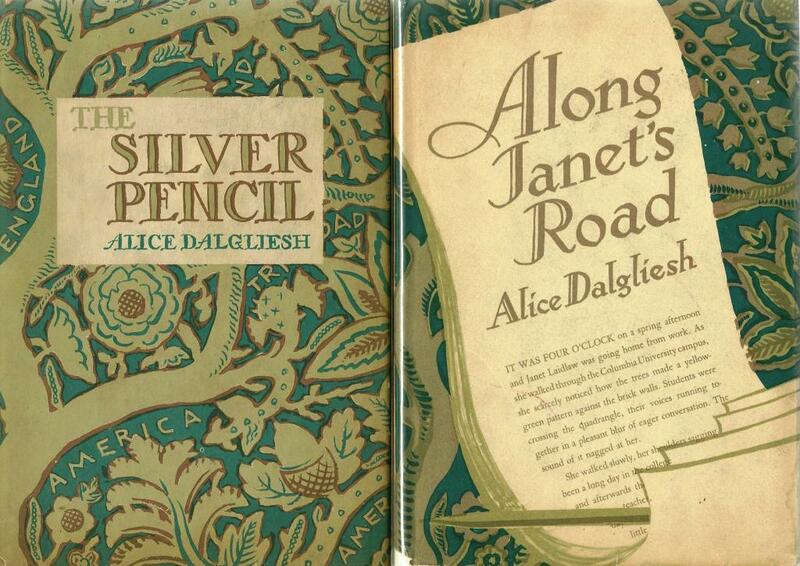 Meanwhile, I have a copy of THE SILVER PENCIL inscribed to the editor and wish I also owned ALONG JANET'S ROAD. We have a lot in common. I think we'd be friends. When I was looking at Dalgliesh's THANKSGIVING STORY it dawned on me that that book received its Caldecott Honor the same year that THE COURAGE OF SARAH NOBLE got the Newbery Honor. Has any other author ever published a Newbery and Caldecott Honor in the same year? As I pondered that subject, I thought, "It must have been a real red letter day for Dalgliesh, having two of her books cited on the same day." 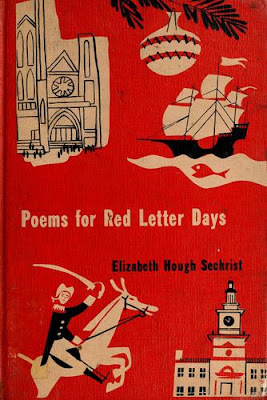 Does anyone else remember Elizabeth Hough Sechrist's POEMS FOR RED LETTER DAYS, the go-to anthology for holiday poems in the 1950s and 1960s? From what I understand, the term "red letter day" originated with old church calendars, so it's perhaps not surprising that this volume celebrates mostly Christian holidays (Epiphany, Saint's Stephen's Day) while ignoring all other cultures. Granted, multiculturalism wasn't a big deal in fifties America, but even then, most children's holiday books would at least toss in a few reference to Jewish holidays such as Hanukkah or Passover...but none are represented here. I was intrigued to discover that POEMS FOR RED LETTERS is once again available to modern readers, as a $32.75 print-on-demand volume. It would be interesting to know how many libraries will purchase it as an example of a children's classic, or whether they'll decide to spend their money on modern books which has a more mutlicultural focus. 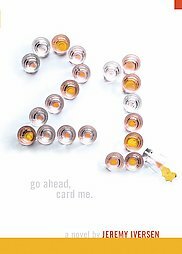 A blog reader recently asked me to recognize the Child Study Association Award. In recent years the name has been changed to the "Josette Frank Award" to honor the Association's former executive director. Given since 1943, "this award for fiction honors a book or books of outstanding literary merit in which children or young people deal in a positive and realistic way with difficulties in their world and grow emotionally and morally." Did you notice something else about this list, guys? And I'm not using "guys" in the vernacular, but actually addressing the gentlemen, dudes, and misters in this audience. There sure doesn't seem to be a place for us on this list, does there? It's a solid list of some very good books...but it clearly seemed slanted for female writers. Last weekend I discussed the reissue of Palmer Brown's novel BEYOND THE PAW PAW TREES. reprint Beyond the Paw Paw Trees. his response, I wanted to revive her so badly. So it sounds like there has long been interest in reviving Mr. Brown's work. Obviously it sounds as though Anna Lavinia changed her mind about being resurrected because a few months ago, ten years after turning down Purple House Press, the author allowed his book to be reissued by the New York Review of Books. 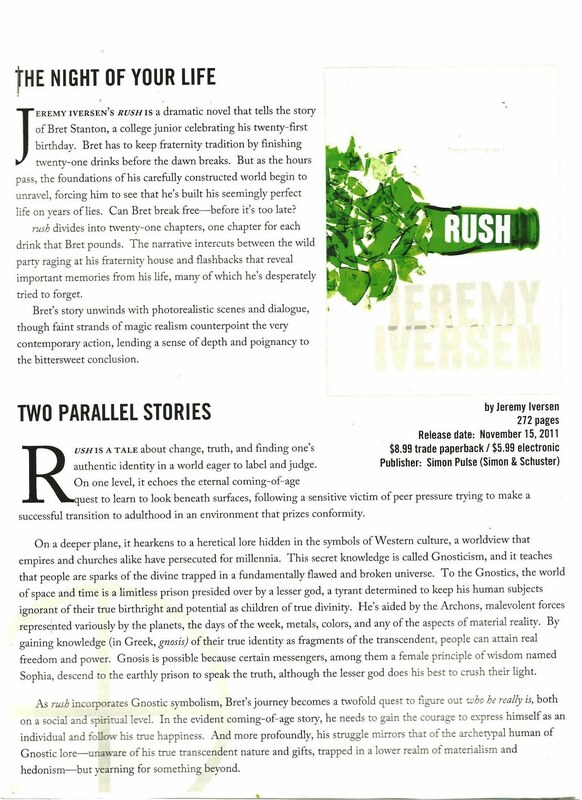 21, RUSH, AND A "HULKING BEARER OF THE ACADEMIC FLAME"
I often wish I had my own review journal. Or maybe my own bookstore. If so, I'd get my hands on advance reading copies of books, all kinds of promotional materials, publicity packets, and other related ephemera. As it is, I have a regular daily job, blog on the side, and only get a freebie ARC or publicity packet about once a month. Of course I'm grateful for everything I get (I do a happy beagle dance every time a box or large envelope arrives) but just wish such things arrived on a daily basis. Especially when I receive something as fascinating as I did this past week. It was an ARC of a forthcoming book called RUSH by Jeremy Iversen. The name rang a bell and I remembered that I had read his nonfiction book HIGH SCHOOL CONFIDENTIAL a few years back. 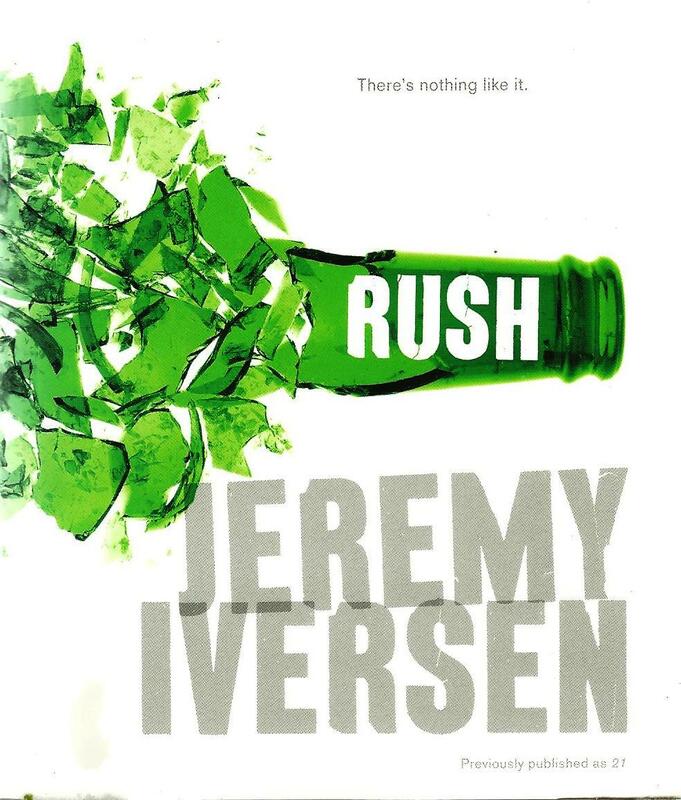 It turns out that 21 was the "preliminary edition" of this forthcoming novel RUSH. Have you ever heard of a book's first edition being called its "preliminary" edition? Or having a newly-revised edition of the same novel released less than six years after its original publication? Obviously I'm going to have to get my hands on a copy of 21 and compare the two books side-by-side. Sounds like my kind of assignment! This new edition is being released with quite a bit of fanfare. 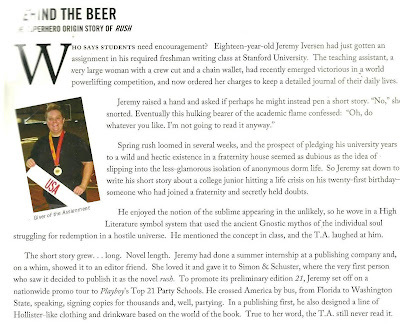 Accompanying the ARC was a twelve page packet of info about how the book came to be written and how it was received by critics. There's a lengthy summary of the novel and a big write up on each character. I was surprised they didn't include the author's phone number. 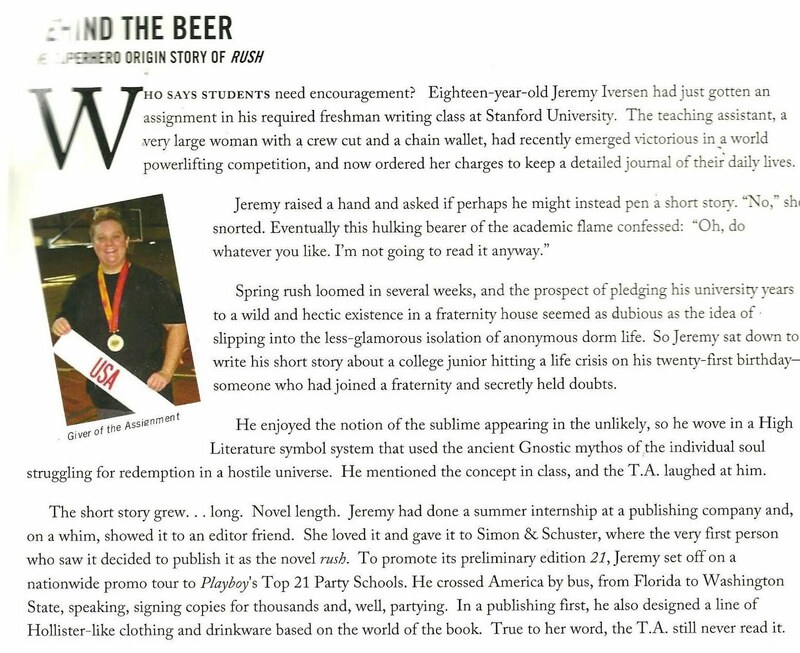 Eighteen-year-old Jeremy Iversen had just gotten an assignment in his required freshman writing class at Stanford University. The teaching assistant, a very large woman with a crew cut and a chain wallet, had recently emerged victorious in a world powerlifting competition, and now ordered her charges to keep a detailed journal of their daily lives. Jeremey raised a hand and asked if perhaps he might instead pen a short story. "No," she snorted. Eventually this hulking bearer of the academic flame confessed, "Oh, do whatever you like. I'm not going to read it anyway." The packet goes on to describe the story he wrote and how, when "he mentioned the concept in class...the T.A. laughed at him." We then learn that when the "preliminary edition" of the book was published, the author went on a nationwide promotional tour by bus and "true to her word, the T.A. still never read it." I must admit I'm fascinated by all this. The promotional packet even includes a color photo of the "Giver of the Assignment," obviously taken at a sporting event. She's not identified by name. I'm just dying to know if she's playing along with all this or whether the writer is using this opportunity to get even with her for laughing at him and still not reading his book. If she's playing along with it: well, good for her, laughing along with the whole thing...even being called "hulking." If he's getting even with her: well, good for him, laughing back at a teacher who never took his work seriously and still refuses to read it. Either way, I'm fascinated by the book's backstory and now can't wait to read it. With Thanksgiving on the horizon, let me say again how thankful I am to everyone who stops by this blog. Maybe there will be time for another blog entry this week. If not and this is the last time we meet this week, I hope you and yours have a wonderful holiday! My question to you is this: If you work in a library or bookstore, do you notice that holiday books only circulate/sell during a very small window of time surrounding that particular day? Halloween books are extremely popular year-round at my library. Fortunately, they are easily identified with stickers on the spine. I don't hear much demand for other holiday books "out of season," though on Friday I did field a request for leprechaun books! Thanks for the Sewell/Williams comparisons for the Little House books. I only knew the Williams illustrations and much prefer them. 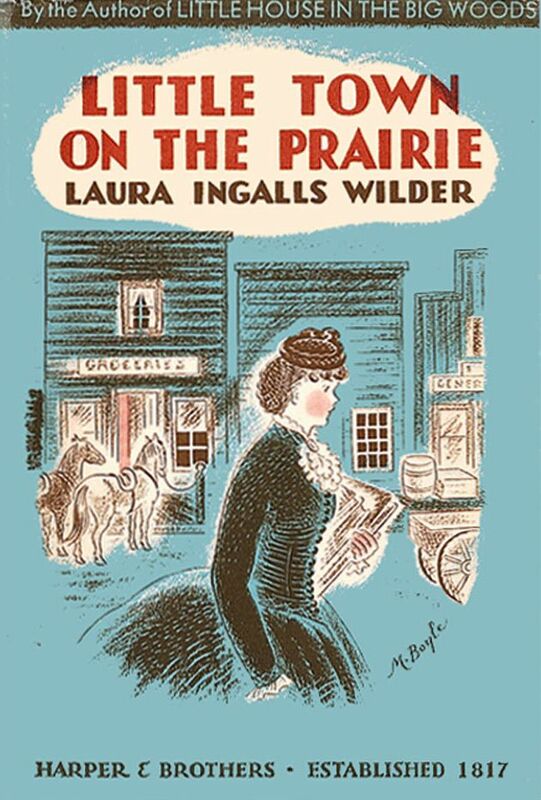 On the covers of Little Town on the Prairie and These Happy Golden Years, Laura looks like a frumpy middle-aged woman. Sewell v. Williams: Williams wins on all the covers except for The Long Winter. Sewell takes that one. I never thought that the Williams cover matched the grimmer-than-usual fare within. 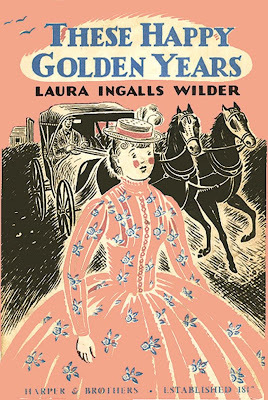 On Sewell's These Happy Golden Years cover, Laura looks a little worried that Almanzo might run her over with his team and buggy. Marjorie Hill Allee, author of The House, is a favorite of mine. She was a noted Quaker and as I recall she attended the University of Chicago and her husband was a noted scientist there. Her 20th century heroines are usually interested in and skilled at science in an era when that was unusual. Her books are in a box I have not yet unpacked but if I recall correctly The House is about a group of students at the University of Chicago. Her historical novels are often about resourceful orphans or intrepid Abolitionists. My favorite of her books is Winter's Mischief, a charming boarding school story set at a Pennsylvania school based on Westtown where Mrs. Allee's daughter was a student. I work in a library that keeps holiday books in storage due to space issues (Christmas, Thanksgiving, Halloween, Hannukah, Valentine's Day, & Easter). We tend to bring them out when we start getting questions (Christmas books made an appearance in early November this year). We don't get a lot of requests for them in the off-season, but I'm sure a lot of them would circulate if we had room to keep them out - especially the picture books. Probably not the informational ones. Our holiday books are out in the open, but still keep their one-week check-out period, which probably limits their circulation. However, we occasionally do find the Christmas ones in a pick-up, and Dora the Explorer holiday books have been going out whatever the time of year. I agree with Bybee that only Sewell's The Long Winter is a match for Williams' covers. I like the Sewell's style, that almost Art-Deco look, but it doesn't match up with the prairie. Happy Turkey Day, Peter! I give thanks that you do such thoughtful and fun entries. Peter, I do see a slight uptick in seasonal and holiday requests, but I do get these requests all year round, maybe more such than shops that sell only new books. Since about 80% of my inventory is used, I get people looking for out-of-print books. As for how holiday or seasonal books sell, I’d say everything depends on the book, and generalizations can’t be made. MOUSEKIN’S GOLDEN HOUSE was OP the last time I checked. THE ALL-OF-A-KIND FAMILY came back into print. THE NIGHT BEFORE CHRISTMAS will never stop selling. All of those are dear, beloved stories. Others appear, have their day (or don’t) and fall by the wayside. That Purple House story about Palmer Brown is the same one my son told me. Whatever the reason for his change of mind, I'm happy for it. Will have to look at the LITTLE HOUSE covers when I'm near a faster connection than I have at home. I have worked for a number of bookstores over the years and they all handle Holiday books the same way. A few weeks before said holiday, we receive vast amounts of books pertaining to that holiday, which are then set up on some sort of display. They are even marked in the computer as Holiday so that they do not get shelved in with regular stock. Then, the day after, say Halloween, all the books are taken to the back room and returned to their respective publishers. People can order the books if they want, but not many people do. If there is a non-returnable book (we had a number of St. Patrick's Day titles this year), they are kept in the back room until that particular Holiday rolls around again. Typically, Holiday books sell very well. One thing you will rarely see though, books for 50% off. Yes, it happens, but usually it is the stuff we can't return. The good stuff like Polar Express and Dear, Virginia goes back because they know they can always sell it again next year, for full price. "ten years after turning down Purple House Press, the author allowed his book to be reissued by the New York Review of Books"
This may have had more to do with WHO was asking than any particular qualms about reissuing in general. 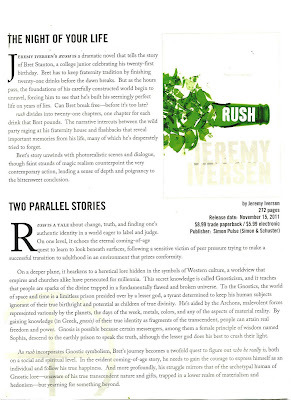 PHP has a long and distinguished history of trampling all over nostalgic re-releases while NYRB is QUALITY. "The only disappointment is that this edition is considerably smaller than the version I remember reading so it seems that the illustrations were shrunk down to fit on the page. For example, there is one page in the text where Mr. Pine plants a bush next to his pine tree to differentiate his house and wakes up to find that all 50 houses on his street now also have a bush next to their little pine tree. The problem is that you have to practically squint to make out what are supposed to be the bushes and the trees." "Unfortunately this edition is printed in China and I found the pages are hard to turn. I had to keep looking at the page numbers to make sure I didn't skip any pages." "THIS TEXT has been corrected—for the first time—against John Masefield's manuscript, now held at the Harry Ransom Humanities Research Center, the University of Texas at Austin. Masefield produced different versions of The Box of Delights, and the manuscript preserves several earlier drafts of numerous passages. There are more than four hundred pages of manuscript and typescript with many corrections, additions, deletions, and alterations. There is evidence that at one point Masefield may have dictated the story to his typist. Additionally, there are several passages present in the published edition of The Box of Delights that do not appear in the author's manuscript and which have been retained here. During the process of book production the original publishers found, after setting the proof, that there was insufficient space to fit in all of the illustrations. Masefield therefore cut a few short passages to accommodate the illustrations provided by his daughter Judith. These passages have been restored here in addition to other sections present in the manuscript that failed to appear in print through error. This edition therefore presents a text based on a proof copy preceding the first English edition, corrected from the manuscript. I have resisted the temptation to include deleted passages unless there seems a compelling reason for their restoration. The appearance of Barney Dog in the train corridor is in Masefield's original version, and is, I think, clearer for a modern audience." I am no big fan of the movie novelizations etc. But I will say that my 4 year old loves the Easy Reader versions of all movies and shows and they have really encouraged him to blossom as a reader. The familiarity makes it easier for older kids who struggle with reading, too. So while I acknowledge their lameness, I do like that they exist. I think the cover Sewell did for By The Shores of Silver Lake is really well done, quite lovely. I like Sewell's covers for some of the early books. William's illustrations have a more human element and warmth to them and are much more appealing to young readers.